Not every child loves the traditional sandwich for lunch. There is no doubt that every child is different and enjoys his or her favorite foods. When it comes to school lunches, make a commitment to ensure your kids have enough healthy food in their lunch box to keep them fueled and energetic throughout their day. Yes, it can be tiring making lunches every morning or even at night before bed. Having some fun new lunch box ideas keeps it interesting and, hopefully, easy for you to send your child to school with a nutritious lunch. If you find a few different meals your kids like, it’s okay to send the same things over again. You are less likely to have a full lunch box come back home again at the end of the day if you take the time to fill it with nourishing, tasty food your kids love. Another way to get kids to eat the food you so lovingly prepare, is to let them choose what goes in their lunch box. Let them help shop, make the menus and pack their lunches. You’d be amazed what a dif­ference this makes! Don’t be afraid to feed your kids leftovers! Find a good thermos or two and they can have a healthy hot lunch. It’s so easy to make extra soup, chili or pasta dishes so you will have leftovers. 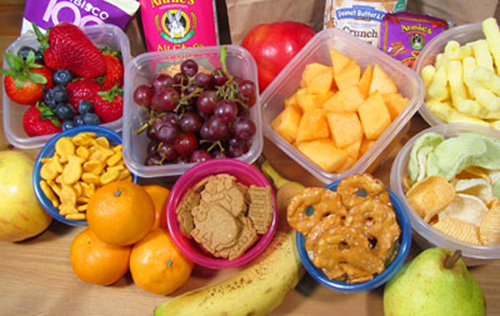 Here are 20 ideas to fill your kids’ lunch box. Snacks that kids love can be put together to make a lunch box meal with lots of variety. Put one or two tablespoons of chicken or tuna salad on a leaf or butter or iceberg lettuce and roll up like a tortilla. My kids think “Lunchables” are cool but I don’t, so we create our own at home. This is a great place for the kids to get creative. Let them choose their ingredients. Make sure to use whole grain bread or tortillas. Even if your kids complain, keep trying! White bread has absolutely no nutritional value. Also try to buy nitrate free and low sodium lunch meat. Processed meats are not a healthy choice. Put a leaf of romaine or red leaf lettuce, tomato slices and avocado on your child’s sandwich, if they will eat it. Any place you can sneak in extra veggies is good! Mediterranean Wraps or Pita Pockets are also great sandwich alternatives. 20. Left over slices of steak with lettuce, tomato and avocado slices.